WPWebHost Review 2019: Is WPWebHost a Good Hosting? WPWebHost is a website hosting provider specifically designed for WordPress websites. They have servers located in multiple locations and an average of 100% uptime, according to third-party tests. Founded in 2007, WPWebHost is a leading website hosting provider based in Southeast Asia, specialising in WordPress hosting. They currently provide hosting services to over 100,000 customers. Their servers are located in two data centers; one in Singapore and one in America. Their website and support are available in English. As a WordPress only website hosting company, WPWebHost only offers shared hosting and not virtual private servers or dedicated servers. They have four packages: WP Blogger, WP Lite, WP Plus, and WP Geek. It’s important to discuss their average uptime. Firstly, whilst it took me a whilst to find, they do state on their website that they have an uptime SLA of 99.5%. This is pretty good, however, what I like most is how it is well documented in their terms and conditions with clear guidelines on compensation. Secondly, third-party tests show that in a 30 day period, their actual uptime was 100%. This is clearly a great uptime average and a great SLA. As WPWebHost focuses solely on WordPress website hosting, they are able to provide features tailored specifically to this niche. They integrate with Jetpack, which provides over 200 free themes that can be set up with just a couple of clicks. WPWebHost also integrates with WordPress Toolkit for one click installation, sandbox testing, and security scanner, and provides WordPress auto updates, website traffic statistics, and much more. 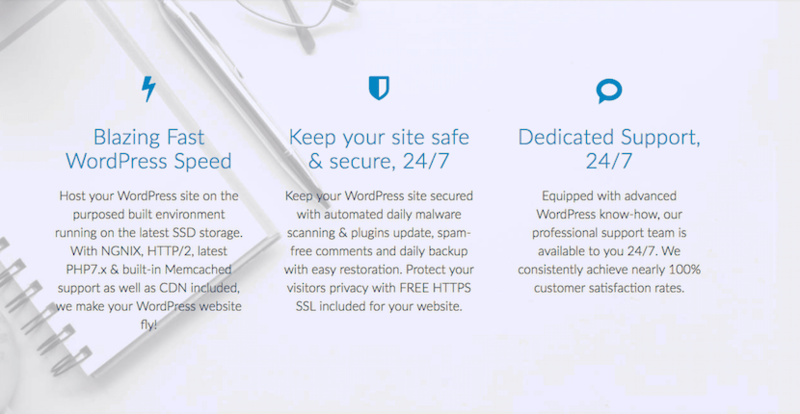 As well as their excellent WordPress features, WPWebHost use high-quality hardware including the latest SSD storage, multiple server locations in America and Singapore for global customers, and to add even more value, they include a free CDN to ensure that your visitors will always enjoy faster website loading speeds and better security. Their prices are quite high when compared to both local and international competitors. That said, if you are looking for specific WordPress hosting which comes with extra features to help you build your WordPress website quickly and easily, the extra cost could be worthwhile. When you checkout, you can choose to purchase hosting in one, twelve, twenty-four, or thirty-six month terms. The discounts for purchasing a longer term are quite steep. I like the option to choose a no obligation monthly trial, as well as being able to choose a lengthier term to get the discount. There is no free trial or free version, however, they do offer a 30-day money back guarantee. WPWebHost customer service is 24/7, which is great, and they offer both live chat support and Facebook messenger. I really like being able to get support at any time of the day or night. Even so, I have had to wait several hours to get a response on occasion. Their help is available in English and the support staff are very knowledgeable. One area for improvement is their knowledge base, as there are currently no help documents available on the website. WPWebHost is a subsidiary company of Exabytes, one of the leading hosting providers in Southeast Asia, therefore they have access to top-class infrastructure for their WordPress only hosting. Wondering how WPWebHost stacks up against other Web Hosting companies? Enter any other Web Hosting company and we will give you a side-by-side comparison.